I've known for a while that it's more dangerous for parents and big kids to go down a slide with a baby. Slides rely on physics. If you increase the weight, you increase the speed, unless you're wearing really strange pants. I think the same applies to a lot of things in life. If a child is too small to do it themselves, having an adult do it with them isn't going to make it safe. My kids like to climb trees. We have a rule that you can only get up if you can get yourself up. And if you can't get yourself down, you don't get to get up again. It took me a long time to realize that toys should be confined to a small space. 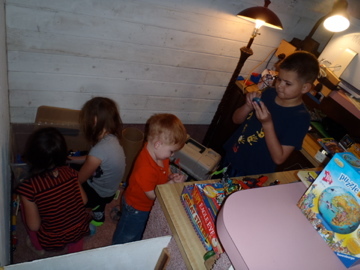 This house affords us the luxury of having small toys, like marbles and legos, confined to a tiny space. It's funny how all 4 of the "big kids" were in there the other day. Usually it's too messy and only 1 can be in there at one time. It was still messy, but they made do. I love it when they do. Today I was out shopping with just L. A man at Homedepot asked if I have more children. His words were "Don't you have a lot of kids?" Yes, they were home with dad. The man commented that he remembered me because he used to work at Winn Dixie and he really noticed how well behaved the children were at the check out. Yay! We don't go to Winn Dixie often. But the other day we had a sweet experience. I asked G to get BBQ sauce and I shadowed him in the store. The cashier signed to him "How are you? Do you have your card? Thank you" This grocery store is really close to the school and we sometimes see students doing a work internship there. I'm trying to teach the kids a lot of independence skills. As soon as they're interested in something. I talk to them about doing it. I try to give them some guidance. And I praise them for doing things. I hope they will be able to cope with new situations. G is the king of doing hard things. He's also 11. But then today G got mad that he had only 4 hours playing computer/wii, and not the 5 that I claimed he had. It's so frustrating how ungrateful they are. So now I need to mark on the calendar to have a strict 20 minute turn rule. I hate it when they need to be commanded in all things!